When life is so busy, I’m all for taking a few cooking shortcuts… and you’d need not feel guilty about it. Especially when the results are so delicious that your guests ask for the recipe! So without further ado, may I present the recipe for one of my favourite desserts, the wickedly good, no-bake Scnickers Cheesecake. Chocolate, salty caramel and nuts – YUM! What’s not to love? Grease a 20cm-round (base) springform pan and line the bottom with baking paper. Using a food processor, process biscuits and coconut to resemble a fine crumbs. Add butter. Process until combined. Press the biscuit mixture over base and side of prepared pan. Refrigerate for 10 minutes. Note: to keep the rustic look and feel of the cheesecake, don’t make the edges of the biscuit base uniform. Sprinkle gelatine over boiling water in a small heatproof jug. Whisk with a fork until gelatine has dissolved. Set aside to cool. Meanwhile, using an electric mixer, beat cream cheese and caramel sauce until light and fluffy. Gradually beat in gelatine mixture until combined. Fold in whipped cream and 1/2 of the peanuts into the mixture. Scatter the remaining peanuts over the biscuit base, pour mixture into the prepared pan, levelling top with a spatula. Cover. Refrigerate overnight or until set. Remove the cheesecake from pan. Decorate top of cheesecake with melted chocolate and serve. Oh so good Julia! 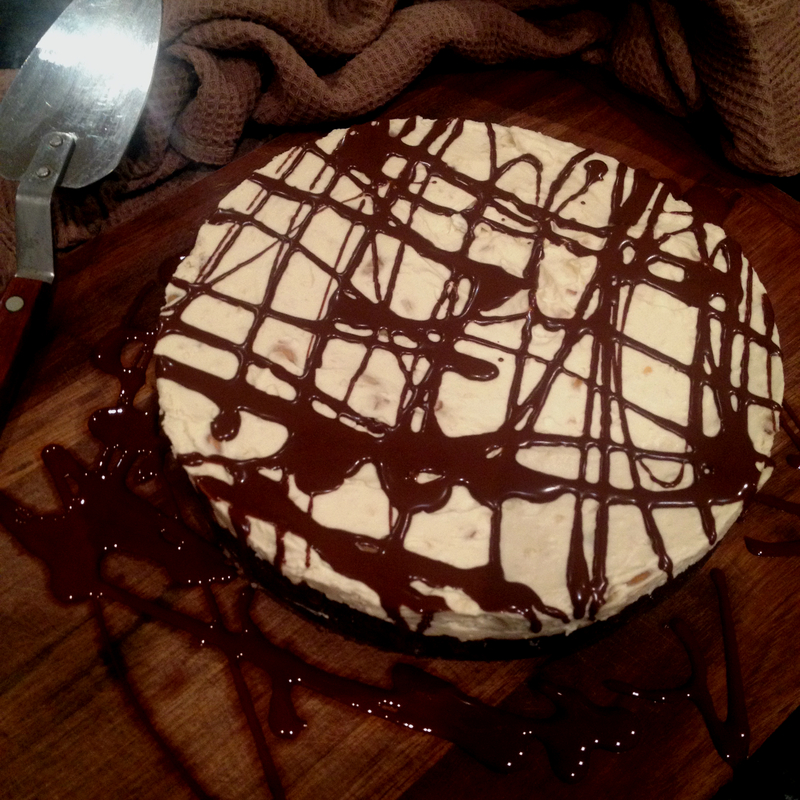 Chocolate, caramel, nuts and cheesecake… how good it go wrong! ?